Aumont-Aubrac is a well-known stop on the Via Podensis pilgrim trail to Saint Jacques de Compostella. Situated at an altitude of 1000 metres, and with a population of 1000, the village is at the heart of the Massif Central, between the Aubrac and the Margaride, and is the perfect base from which to enjoy a multitude of activities. Explore our region, its landscape and its culture, on the numerous footpaths that lead into spectacular, unspoilt countryside where the air is pure. Discover the fabulous cheeses of the region at Chapert’s cheese shop. The local market provides the opportunity for smaller producers to present their wares – tradition, quality and choice. La Chaldette at the heart of the Aubrac this thermal station offers relaxation and well-being. The Château of the Baume, protected by strong granite walls, was once the stronghold of the local nobility. The castle has been carefully preserved and elegantly decorated by artists and craftsmen from Paris and Montpellier. Its owners, the family of the Count of Las Cases, have held the property since 1858 and continue to ensure its conservation and charm. The plateau of the Aubrac shelters numerous hamlets and villages with beautiful Romanesque churches, and at Laguiole you can visit the famous knife workshops and cheese dairies. The waters at Chaudes Aigues are the hottest in Europe, reaching a temperature of 82°C. Visit the museums at Saint Flour, before stopping to admire the sites of Garabit, with its viaduct, rock formations, Granval dam and the castle of Alleuse. At the heart of the Margaride, the Mont-Mouchet memorial pays tribute to the bravery of the resistance movement during the Second World War. The museum of the Beast of Gévaudan and the diorama of St-Bénilde à Saugues. The Salmon museum à Brioude. Two animal sanctuaries : the European bison herd and the Gevaudan wolves. 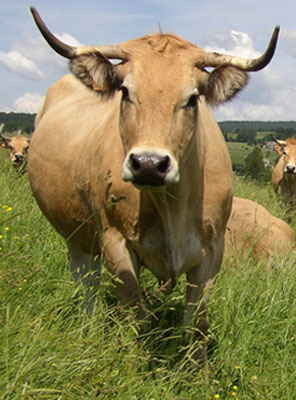 Specialist farms raising rare breeds such as wild ox and deer, the Villaret valley and the medieval working farm at Villard. The Lakes and numerous aquatic activities. The Coutellerie de Laguiole Honoré Durand’ : Blacksmith & Handmade Laguiole knives in Laguiole.